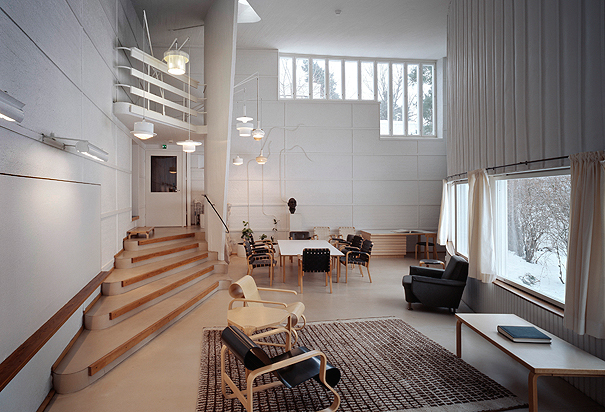 Today I visited Alvar Aalto’s Studio/Museum in Monteniemi. I have been longing to see this small building for many years, but what I experienced was very different than I expected. I thought it would be an active space, full of the energy of the studio where sometimes 50 architects worked elbow to elbow late into the night to draw competition entries for projects all over the country. But it was quiet, not just because there are no architects working there any more. It was quiet because it was intentionally designed to be that way. The softness and stillness of the sound inside the building was very distinct. The Studio was designed in 1955 in a residential neighborhood several miles from downtown Helsinki. The studio had outgrown their space in the Aalto house a few blocks away, where 10-15 architects worked since 1936 in a wing attached to the home. Aalto chose this nearby site and built his studio here because it was quiet. He purposely designed it to turn away from the noise of what even then was then a quiet, rural neighborhood. The wall facing the street has no windows, and the studio spaces turn inward to a stepped amphitheater and garden. Stillness is the quality of winter, when ideas gestate below the surfaces, waiting for spring to burst forth. The element for winter is water, and the sense associated with it is hearing. In stillness we can hear our innermost thoughts. The studio building, especially Aalto’s wing, has this stillness quality about it. Not because it was essentially empty when I was visiting it, but because the energy of the space held this quality. There was no backround noise, no sound of cars or buses driving by, no distractions to take the architects thoughts away from their work. Surfaces materials were carefully chosen to make the space quiet. The floor is linoleum, the north wall is acoustical panels with horizontal battens to hang drawings from, and the south wall above the windows is a “pillowed” acoustical material with vertical battens that makes it look almost like logs. There are no parallel walls, no square corners to bounce sound around. The curves and angles quiet the space. Inside and outside, the house is almost all white. Unlike most of Aalto’s residential scale buildings, there are few changes of materials, few flourishes of wood. The building was a simple container for the activities of design and conceptualization. With the garden amphitheater at the center, everyone in the studio was reminded that nature is at the heart of design, an organic pursuit as much as an intellectual one.